My oldest son and I were able to tag along with my parents this past weekend to go to a family wedding in Seattle. We had a lot of fun - did some cool tourist-y things, and got to see some family that we hadn't seen in a long time. We're exhausted now, but it was worth it. First things first, I promised a photo of my son and myself in our wedding outfits, complete with the pleated wristlet I made last week, so here you go! I notice in the photo that you can't see the green in the dress, but trust me, it's there! On Sunday morning, prior to the wedding, we went downtown Seattle to take in some of the sights. We went to the top of the space needle and even had lunch up there. Very cool, and lots of fun! Probably a "must do" if you visit Seattle. 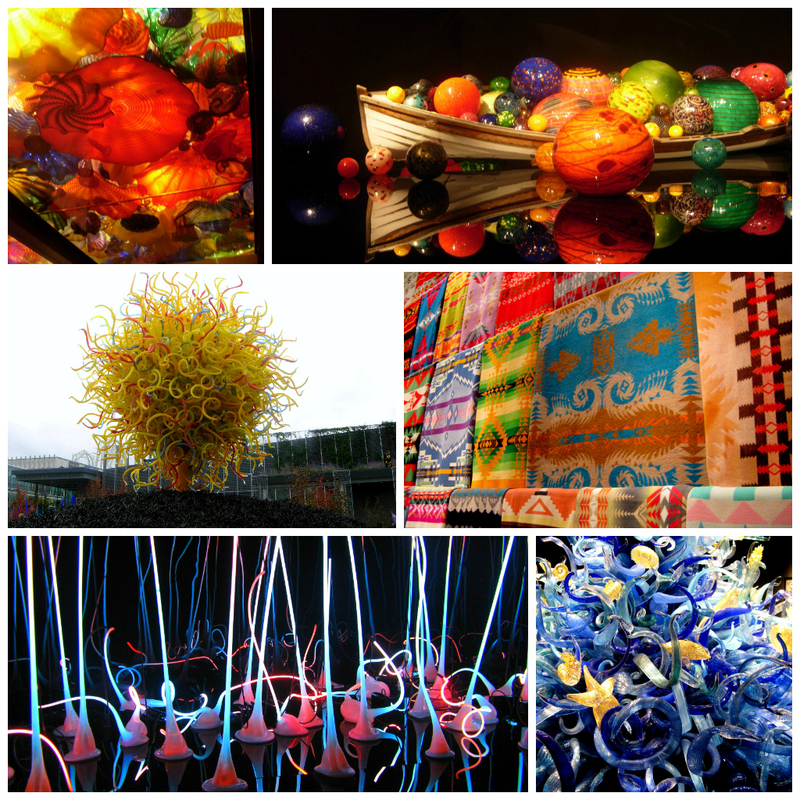 Included in the space needle ticket we purchased was admission into Chihuly Garden and Glass. This is a stunning display of colour and artistry, highly recommended. My 10yr old enjoyed it as much as the adults did. If you ever have the chance, do take it in. Finally, what is a trip without a visit to at least one fabric store?? Granted, it was only at Joann's, but it was my first time there so it was still fun. The lines at the cutting tables were veeeeeery long so I didn't have time to choose any yardage since we were on a bit of a schedule as far as getting to the ferry in time, but I did pick out a colourful stack of FQs. So I did come home with a bit of souvenir fabric which is fun! I would have loved to meet up with some Seattle bloggers (Jenelle, Debbie....), but alas this visit was just too short to fit that in. Next time we'll take a bit more time, bring the rest of the family, and take in more of the sights. You two are so cute! Glad you had a good time in Seattle! There is a Chihuly piece at the Children's Museum in Indy that we've been to a few times. They really are spectacular! Nice seeing you and your handsome date. Isn't Seattle great? I had no idea the Chihuly exhibit was there, I should make a trip over to visit a friend and go see that. Sorry you were not able to SHOP at JoAnn's, must have been a big sale weekend. Maybe next time you could go to Pink Chalk Fabrics - located on one of the islands I think. Yes it is on Bainbridge Island. I've always wanted to go to the shop. Very cute date you had there! I got married in Seattle. LOVE that city! I miss it, especially the rainy weather which is my favorite. Your green clutch is so cute. Y'all look great! Looks like you had a fun weekend. Fun! Nice to have a day out and you look great! Sweet outfit! It's always too short a visit to do all the things you want...you'll just have to go back again! I've never seen the glass exhibit, so definitely next time I go down I have to make that a priority. You both look gorgeous! I need to get to the Chihuly exhibit next time I'm in Seattle. The commenter above may have been thinking of Island Quilter which is on Vashon Island, just a short ferry ride from South Seattle. Nice picture with your handsome man :) I think I might buy that pattern. I really like how you made it in a solid - works for something dressier. Thank you for a dress pic. It's cute! Love the sweater, too. Looks like you two had fun. You and your son look great. Always good to have a break, glad you enjoyed Seattle. The clutch looks cute with the dress and I think I can just make out the green in the dress.